IHS Class of 1969 - 50th Reunion! We want to thank everyone who responded to the 50th Reunion Survey! The main Event is Saturday night October 19th starting at 7PM. For those of us not ready to quit at 11PM, we will have a hospitality suite for post-event partying. We sincerely thank you for your involvement in planning our 50th Reunion! We have finalized arrangements with the Doubletree by Hilton DFW Airport North for our venue. We've also negotiated for a discounted room rate of $89/per night for classmates. Please see announcement below with important information to get the discounted rate. Work toward our 50th Reunion is underway, and we can always use volunteers! See announcement below about the next committee meeting. Stay Tuned...we'll be sending out information about the ticket prices and reunion activities as soon as we can! As many of you know, for several reunions, we've been able to keep our admission fees to $69 per attendee although that has been difficult due to rising expenses. We would like to do something special for our 50th Reunion to get the admissions fee lower for ALL attendees. We are offering 50th Reunion Sponsorships at $500 each! With your sponsorship you get two (2) admissions and your name added to the Gold Sponsor Honor Roll to be displayed at the 50th Reunion! Sponsorship funds will be applied to the costs of our reunion before determining the admission fees for everyone. We are waiting on action from our bank before we can accept your credit card! Please use checks for the time being. To become a Gold Sponsor, click on the Sponsorships link to the left. Thanks for your involvement to make our 50th Reunion the best ever! We have finalized our artwork and completed our vendor selection for our Reunion Ts. They are ready for pre-ordering! For the time being, we are only accepting checks. Pre-order yours by clicking on the Tigers Store to the left. They will be ready in time for our reunion. These T's are great mementos of a unique event: our 50th Reunion! Attendees can call 1-800-HILTONS / 1-800-445-8667 to make reservations, provide event name (Irving High School Reunion) and event dates to make reservations and get the $89/rate per night. Rate good Oct 15 thru Oct 22, 2019. The Hilton's national reservation service doesn't have our reunion information yet. Call the direct number 972-815-0215 to make a reservation! There is a lot of work to do before our 50th Reunion. We are in need of volunteers to find missing classmates to let them know about our 50th Reunion! If you would like to help, either join us at the next meeting or click on Contact Us above to send an email. Either way, we will give you a list of classmates to contact. If you're in Irving and would like to join in the work for our reunion, our next meeting is: Sunday, April 28th at 2PM at The DoubleTree by Hilton DFW Airport North located at 4441 W. John Carpenter Frwy. We can meet in the bar at the DoubleTree Hotel on Sunday, April 28, 2019 at 2:00 pm. There is an area in the back of the bar with a large table. It will be good to check out the spaces —bar, common areas, hospitality room, ballroom-- and get a vision of how we want it to go on October 19th. During a previous Reunion, three lapel pins were misplaced. The pins were Toy Tiger, National Honor Society and I-Teen pins. The owner would love to find them. If you know where these might be, please click on Contact Us, and let us know. 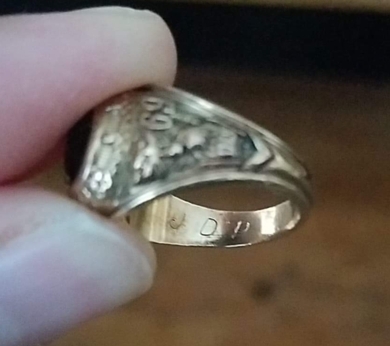 Hello I wanted to see who I could get in contact about a lost class ring I found. I've had it for about 10 years. I was going through my saved memories and found it again! I really want to get it back to the person that lost it. I found it in Harlingen Texas at a movie theater I worked at. I hope the person who lost it is still in contact with you all. The initials JDP are engraved on the inside. 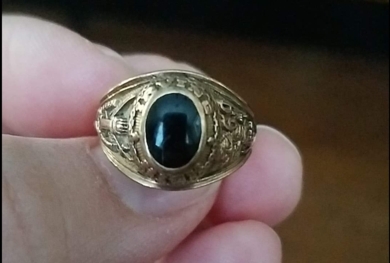 If you lost a class ring in Harlingen, Texas, contact Judith at email address below. Also, please let our website know too. The developer of our underlying website software identified a bug preventing a few birthdays from being displayed on our home page. If you would like classmates to view your birthday (Birthday checkbox on your Profile page) and your birthday is not displayed a few days in advance of and through your birthday, please let me know. Thanks to classmate Wayne Hartman for bringing this to our attention when his June 30th birthday was not displayed. Happy Belated Birthday Wayne! Many of us have used our work email addresses as the primary method for your classmates to contact you when sharing Class of '69 activities. With many of us retiring and/or moving, we would like to suggest that you update your contact information if it isn't current. We'd hate to lose contact with you!